Most of the time, I spend my rest day travelling outside Manila. I feel like mountains and oceans are always calling me. 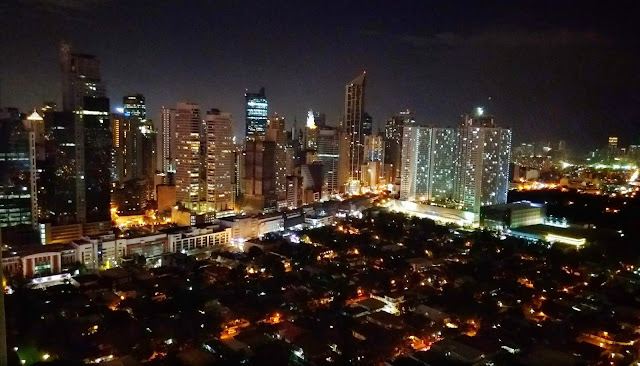 But last week, I decided to stay in Metro Manila and booked a room at The Gramercy Residences. 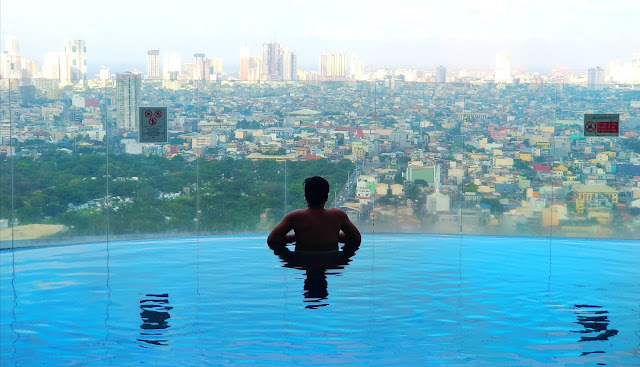 One of my travel bucket list is to have a staycation in a high-rise building with an overlooking view of the city. 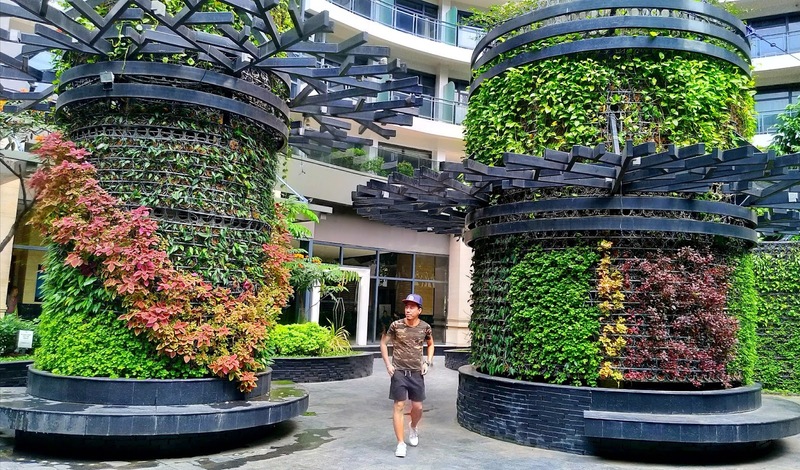 I heard a lot of good things about The Gramercy Residences, also known as The Gramercy Residences at Century City. Some of my friends told me that they had a great stay in this building. So, I decided to look online to find the cheapest room. 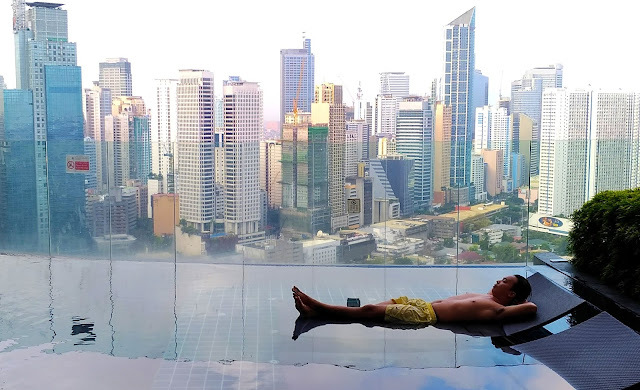 With the help of Staycation Suites Philippines, we're able to book an affordable room at one of the grandest condominium in the country. You can contact them via Facebook Page for the fast transaction. We're given a fully furnished room at the 6th floor. Ms. Yale, our contact person gave us a key and access card for the elevator. Every time you press the number at the elevator, you need to tap first the card on the block box, located at the lower part of the numbers. Once you see a red light from the box, you're good to go. The room is spacious and has around 9-foot ceilings, and glass door and window on its balcony area. 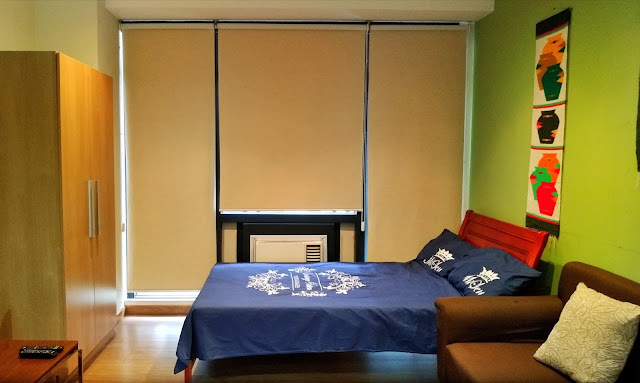 It's a fully furnished room equipped with 2 beds, TV with cable channels, couch, closet, glass table and chairs and bathroom with hot and cold shower. The kitchen has wooden cabinet, a refrigerator, a electric range, a microwave, a dishwasher and some kitchenware and dining utensils. One of the main attractions of the building is its Skypark. It gave us an exceptional panoramas of the city, 36 floor above the ground. The breathtaking view was better at night. 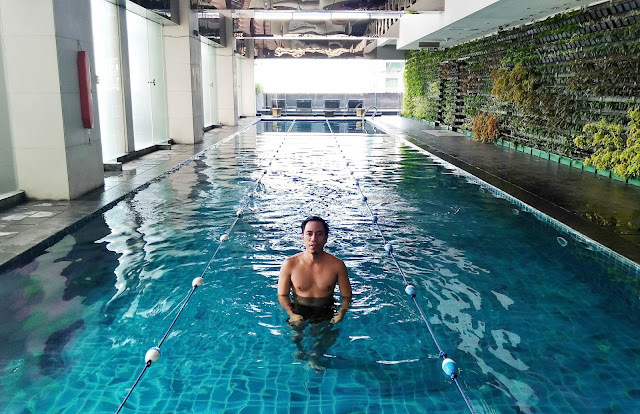 The place had multi-level infinity edge pools and a special pool for swimmers and non swimmers who want to practice their swimming drill or exercises. The level of the water is just 4 feet. 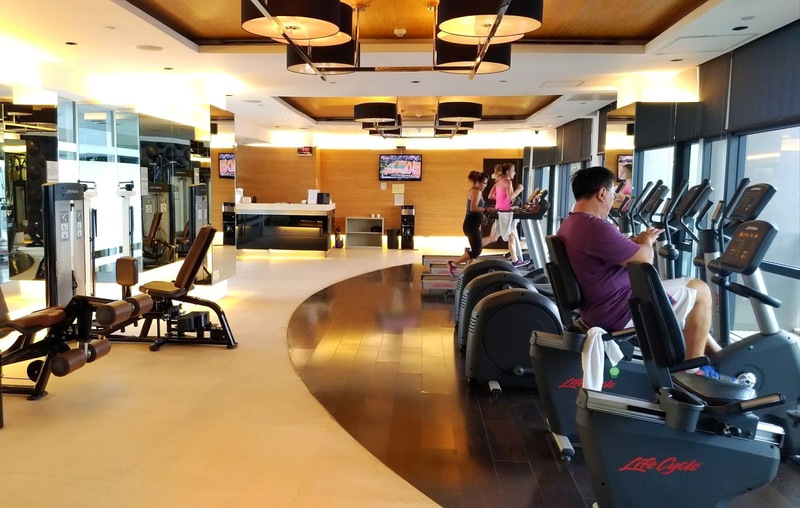 There's also a gym on the 37th floor which I tried for an hour. Look for their FB page and send message either inquiries or room reservation. They usually reply within a day. Please make sure you give them the specific building you want to stay. 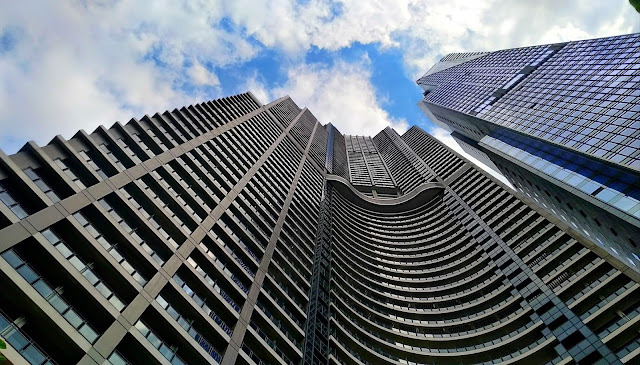 They have units in Knightsbridge Residences and The Gramercy Residences. Once they confirmed the available room, you can deposit your payment thru Bank Transfer/Deposit to BDO. Send them a screenshot of the deposit slip on their page. Send one valid ID for your access card. Once payment is verified, they will send you a message about your booking details, the inclusions, and who to contact in the building. 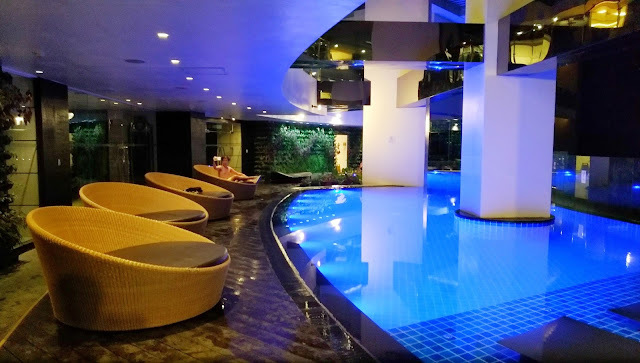 There is a ₱2,000.00 security deposit payable upon check-in. The deposit is for the security of the items in the unit in case there's loss and damage. The amount is refundable upon check-out. Check-in time is 3:00 PM and Check-out is 12:00 PM. Cancelled reservation is not refundable. Parking fee is not included in the rate. Accepting of visitors is not allowed; the only confirmed number of guests in the unit are allowed. Smoking inside the unit is prohibited. Pets are not allowed inside the residence. Chocolate, blood, and other stains on the bed, sofa, and sheets are strictly prohibited. Cooking and bringing food is allowed. Overall, The Gramercy Residences is a perfect place for staycation. We really enjoyed our stay in this beautiful building. The amenities are truly awesome especially the infinity pool with overlooking view of the city. Our contact person was friendly and accommodating. We''ll definitely back here soon! The Gramercy Residences is located along Kalayaan Avenue in Makati Poblacion, and just a block away from the busy entertainment area along Makati Avenue. 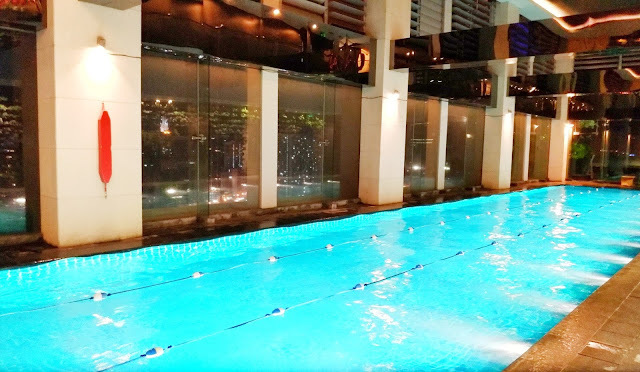 Have you been to The Gramercy Residences? Share you experience, blog or review by putting a comment about this destination. You can also put your questions on the comment box.